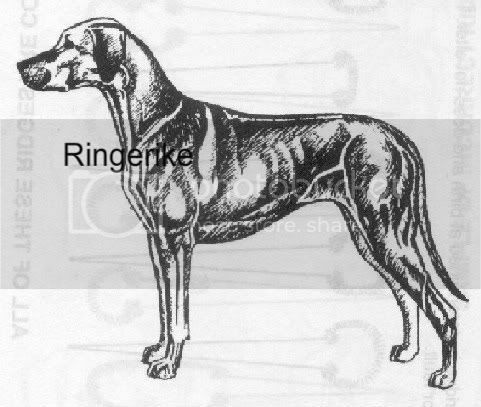 De Rhodesian Ridgeback moet vertegenwoordigen een evenwichtig, sterk, gespierd, behendige en actieve hond, symmetrisch op hoofdlijnen, en in staat van groot uithoudingsvermogen, met een behoorlijke hoeveelheid van snelheid. De nadruk ligt op behendigheid, elegantie en degelijkheid met geen neiging tot massiviteit. De bijzonderheid van het ras is de kam op de rug, die wordt gevormd door de haren groeien in de tegenovergestelde richting van de rest van de vacht. De nok is het wapenschild van het ras. De nok moet duidelijk worden omschreven, symmetrisch en taps toelopend naar de heup. Het moet onmiddellijk achter de schouders en blijven de heup (heupen) beenderen. De nok moet bevatten slechts twee kronen, identiek en tegenover elkaar. De onderste randen van de kronen moet niet verder uit te breiden van de nok dan een derde van het lengte. Een goede gemiddelde breedte van de kam is 5 cm (2 "). 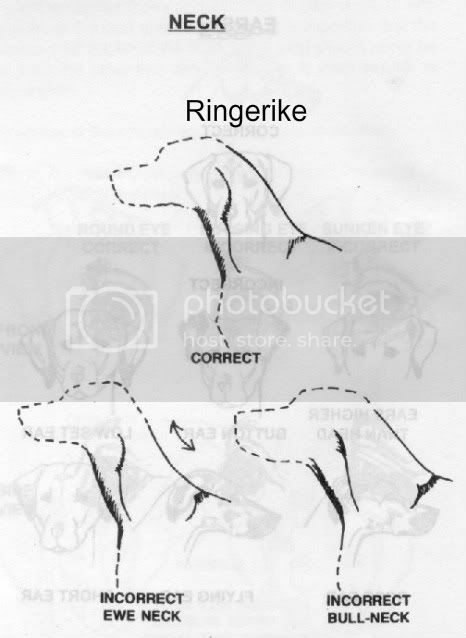 Deze illustratie van een goed uitgebalanceerde Ridgeback geeft aan wat de standaard is streven naar. Skull: Should be of a fair length (width of head between ears, distance from occiput to stop, stop to end of nose, should be equal), flat and broad between the ears; the head should be free from wrinkles when in repose. Stop: The stop should be reasonably well defined and not in one straight line from the nose to the occipital bone. The distance from the tip of the nose to the stop, from the stop to the occiput (bony protuberance at rear of scull), and the width of the scull should be equal. It is important that the distance from the tip of the nose to the stop should never be less than the other two dimensions (i.e. short muzzle is undesirable). Nose: The nose should be black or brown. A black nose should be accompanied by dark eyes, a brown nose by amber eyes. Muzzle: The muzzle should be long, deep and powerful. Lips: The lips should be clean, closely fitting the jaws. 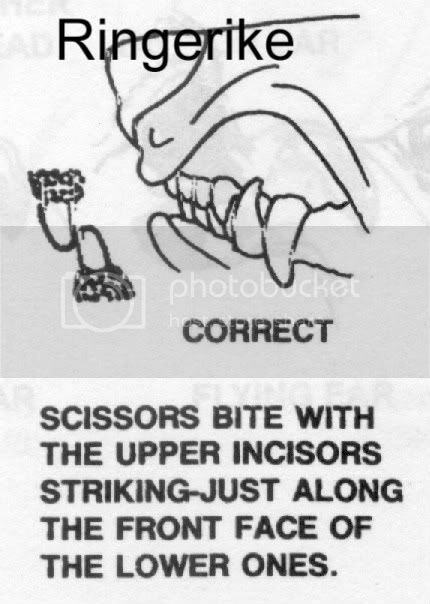 Mouth: Jaws strong, with a perfect and complete scissor bite, i.e. the upper teeth closely overlapping the lower teeth and set square to the jaws. The teeth must be well developed, especially the canines or holders. Cheeks: Cheeks should be clean. Eyes: Should be set moderately well apart, round and bright and sparkling, with intelligent expression, their colour harmonising with colour of the coat. 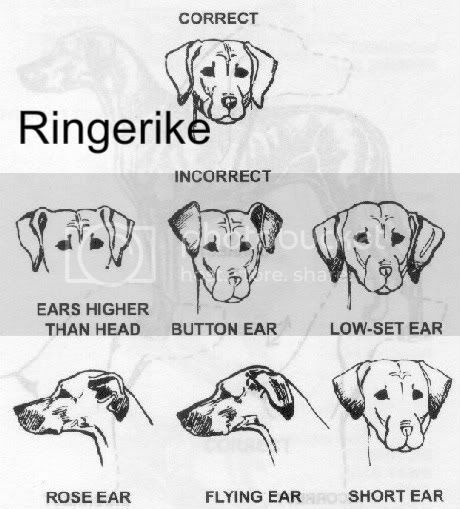 Ears: Should be set rather high, of medium size, rather wide at base, and gradually tapering to a rounded point. They should be carried close to the head. Neck: Should be fairly long, strong and free from throatiness. Dotted line indicates point of shoulder, shoulder lay back & leg. 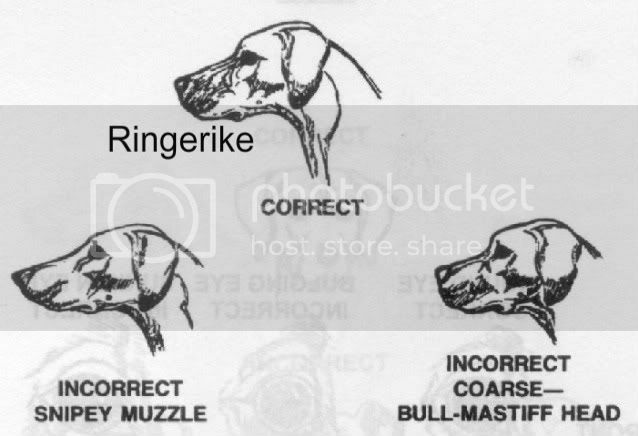 Forechest is used by the dog in a breast charge on game. Should be strong at the root and gradually tapering towards the end, free from coarseness. It should be of moderate length. It should not be attached too high or too low, and should be carried with a slight curve upwards, never curled. 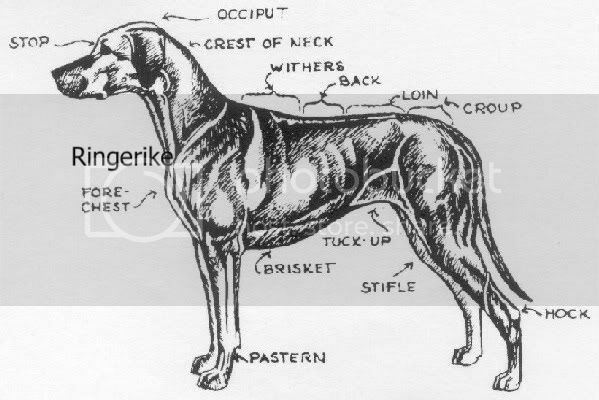 Forequarters: The forelegs should be perfectly straight, strong and well boned, with the elbows close to the body, When viewed from the side, the forelegs should be wider than when viewed from the front. 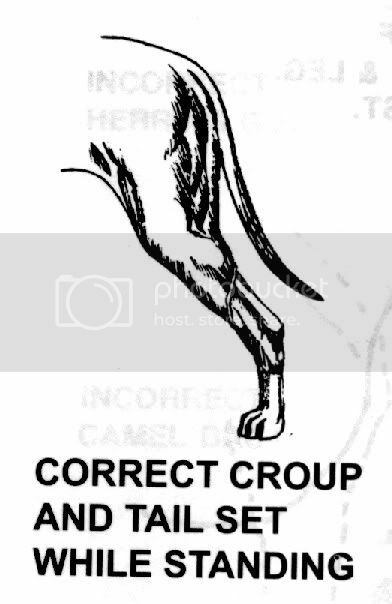 Hindquarters: In the hind legs the muscles should be clean, well defined, good turn of stifle and strong hocks well let down. Gait/Movement: Straight forward, free and active. Colour: Light wheaten to red wheaten. A little white on the chest and toes is permissible, but excessive white hairs here, on belly, or above toes is undesirable. A dark muzzle and ears permissible, Excessive black hairs throughout the coat are highly undesirable. "It was decided that "wheaten" implied the colour of a ripe ear of wheat of which there were two main types, mainly white wheats and red wheats. The ear of the red wheat is usually of a fairly dark reddish brown colour while that of a white wheat os if a golden yellow or paler yellow shade. 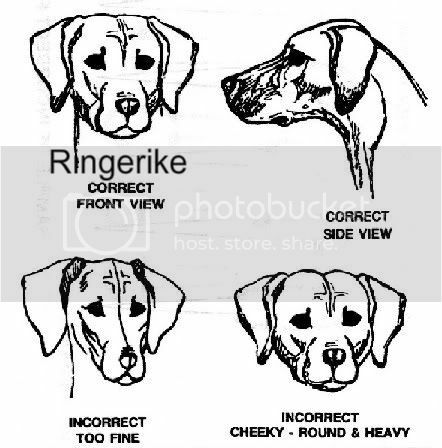 the three primary Ridgeback colours are therefore "wheaten", "red wheaten" and "fawn". Red wheaten implies bordering on a chestnut colour with lighter or darker shades in places. Given this information, it was thought that a determination as to colour should not be difficult". This description still applies today.